The Haitian artist Zula Verna was a key member of the cast in the first production of The Kingdom. She very generously gave me these wonderful pictures. Sadly, I lost touch with her, but over the years, during infrequent moments of tidying, I come across them, and they are always a source of delight. 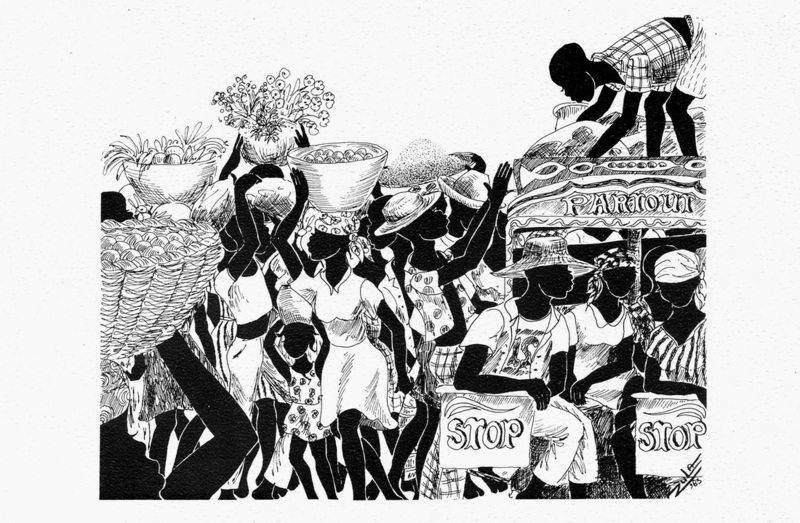 Her beautifully drawn, elegant and dynamic images also provoke in me powerful memories of Haiti. This vivid picture, and the first five images in the slide show below are signed by Zula Verna, 1983. The next five pictures in the slide show are signed by Joan Simmelink, Haiti 1979. I have tried to trace both artists, but without success. Could Zula Verna and Joan Simmelink actually be the same artist? This is a picture of a Tap-tap in Port-au-Prince. Tap-taps are beautifully decorated buses with evocative names and expressions like this one: partout (everywhere). To request the driver to stop, you just tap the bus twice.